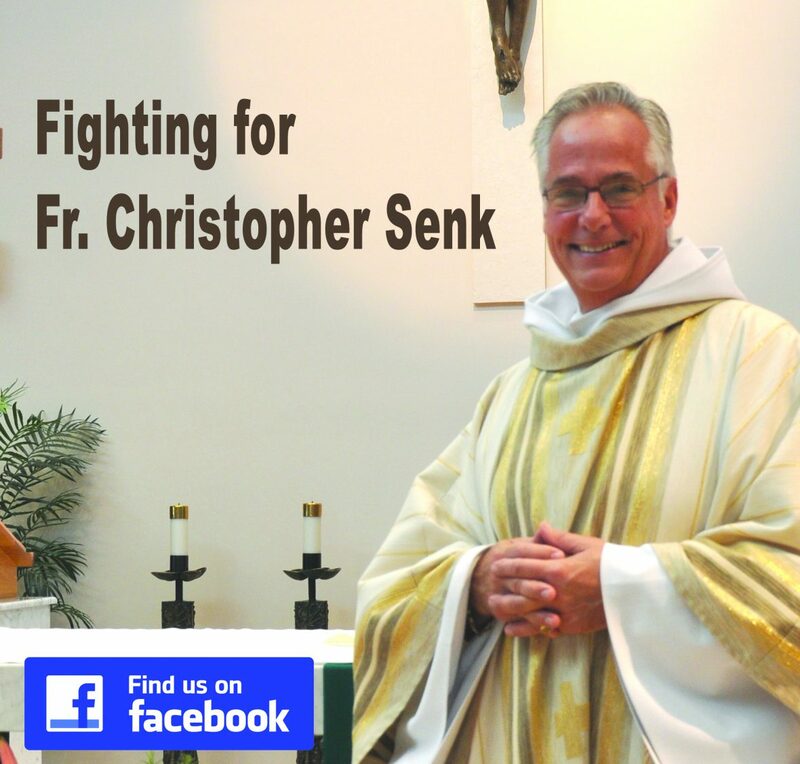 St. Isabel Church on beautiful Sanibel Island has been fighting for the return of its beloved Father Christopher Senk since October 2016. He’s a priest who, after 40 years of devoted and uncontroversial service to the faith, has been accused of soliciting money from a parishioner contended to be of unsound mind. The only evidence of her unsound mind came from unsupported suggestions of two relatives. We saw the parishioner as a bright and independent woman who was active in our parish and whose generosity extended to Father Senk and others. The relatives have made many accusations, which have been proven wrong. The police investigation failed to find sufficient evidence against Father Senk and the state decided not to prosecute. In spite of all this, he now finds himself subject to a ruined reputation and unable to practice his faith as a priest. We are a large group of St. Isabel parishioners who believe in the innocence of our priest and want him back. This site is dedicated to justice for Father Senk. Fr. Christopher Senk has been administrator/pastor of St. Isabel Catholic Church in Sanibel, Florida since April 2003. In the course of his leadership, the parish experienced the destruction of the church building as a result of Hurricane Charley in 2004 and rebuilding that included a beautiful structure and campus. Hurricane Charley was a disaster; but parishioners often comment that it was a gift because it led to the prayerful and serene space which serves as a central location for us to practice and express our faith. During the time of Fr. Christopher’s pastoral leadership, the parish has grown in spirit. It is a strong community of believers who care for and about each other. Furthermore, the parish has made great effort in its outreach, supporting the Bishop’s Catholic Faith Appeal by exceeding its goal each year, by efforts by the Women’s Guild and Men’s Society to support various agencies and organizations in the Diocese of Venice who serve the less fortunate and those in need, and by rising to the occasion whenever needs were identified. During this time, the Bishop of the Diocese of Venice in Florida, Frank Dewane, was a non-issue at St. Isabel. People throughout the diocese heard of Bishop Dewane’s reputation as a bully and control freak based on incidents reported in the news and on the internet. Yet none of this impacted St. Isabel parish directly. The parish continued to grow in faith and in service. The rare visits by the bishop to the parish to dedicate the rebuilt church or to celebrate the sacrament of Confirmation were greeted with excitement. He was welcomed cordially as befits an outside dignitary coming to join the community. As might be imagined, the parish was shocked on October 29, 2016 when it was announced at Mass that Fr. Christopher Senk had been placed on leave by Bishop Dewane. Furthermore, Bishop Dewane had arranged for the media to “greet” the people as they left Mass. The shaken faces, the tears, and the anger are obvious to anyone who has seen the video that was run on television. It was a difficult event, a time of hurt, mourning, and disbelief. In the two-plus years since, the situation has not gotten any better. Bishop Dewane sent a young inexperienced priest to St. Isabel, a priest who was not even allowed to say Mass on Sunday at the parish where he was previously assigned. For a spectrum of reasons, this priest is incapable of bringing healing. At the same time, Bishop Dewane authorized the office staff to undermine all social activities at St. Isabel, denying access to the hall for donuts after Mass, locking the kitchen used for bereavement lunches and other gatherings, even trying to prevent parishioners from praying in the church for their pastor. The actions of the office staff betray the fact that the desire to heal is absent. As a consequence of Bishop Frank Dewane’s actions, of the actions of the substitute priest, and the actions of the office staff, a sense of abandonment, bewilderment, and anger has arisen and grown. This is evident in the letters that have appeared in the Santiva Chronicle, in the Fort Myers News Press, and on this Parishioners for Justice web site. The depth of this anger is sometimes shocking, but it is palpable. From this destruction, Parishioners for Justice has arisen as a grass roots activity of over 500 parishioners and visitors to St. Isabel Church. It has conducted its own investigation regarding the removal of Fr. Christopher and found no justification. It has hired professionals to gather information and prepare a defense. It has raised money to defend Fr. Senk on its own volition, recognizing that Fr. Senk is forbidden from participating in fund raising activity or from publicly defending himself. The purpose of this message is quite simple. Parishioners for Justice wishes to forestall Bishop Frank Dewane trying to imply that an attitude of hostility toward himself, as evidenced by the heartfelt and strong letters that denounce him, was created by Fr. Christopher Senk. Such an implication is absolutely false. We recognize that the letters and sentiments posted on our web site sometimes express raw emotion born from anger. We do not necessarily share the views of all individuals, but we certainly recognize that in this tense situation people need an outlet. We wish to clearly and unequivocally declare that the senseless disrespect of Fr. Christopher and of the people of St. Isabel parish by Bishop Dewane and his cast of hired functionaries have created the current and continuing unacceptable situation. It has become abundantly clear that Bishop Dewane wants nothing less than elimination of Fr. Senk from the priesthood and will use diocesan funds, parish funds, untruths, half-truths, distortions and the simple power of his office to achieve this. Parishioners for Justice recognizes the difficulty involved in demanding justice for Fr. Senk and for St. Isabel parish. However, it also recognizes that if caring and Christian people do not stand up for justice and truth, the message of the Gospel is rather empty.